Raoul Peck: "The cinema is more rigidly formatted today than it will be tomorrow"
As Thierry Frémaux announced, the Jury of the 2012 Festival will “admit the chaos of the world”. 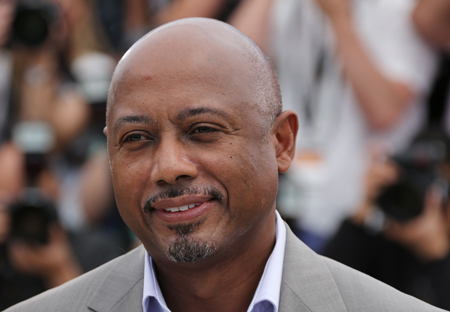 That is one reason he invited Raoul Peck, the Haitian director known for his work in Rwanda and the Congo, to be a member of the Jury. A former journalist in Germany and Minister of Culture in Haiti, Peck finds inspiration for his movies in the great revolts and injustices that abound in history. In your career, is it the cinema that has offered you the most freedom to play a role in society? I have more freedom in a certain manner. Mental, political, artistic freedom but, given that the cinema is an industry, one is faced with the constraints of power and money. I come from the third world, a part of the world excluded from the cinema. When one tries to impose a different vision, a critical vision, it is not necessarily very welcome. Indeed, how free is the cinema in Haiti? And as regards the production and funding of movies? That is more complicated. Some years ago, despite the poverty of the country, things were developing in the cinema. We produced a fair number of films, low budget productions above all, but it was a path that could have led to more professionalism among film-makers and actors. Then the cinema group that has the monopoly in the French West Indies pulled out. And the remaining small theatres were destroyed by the earthquake. You believe that a story should be told from the side of the people in the story and not from the point of view of an outsider. Can you give us more details about your approach? We have no right to speak in the name of others without legitimacy. Africa, for example, often serves as a backdrop in movies. Yet we see nothing of Africa, we don’t understand its problems. I think that we must get accustomed, and accustom our audiences, to other viewpoints. To adopt this stance, we must understand their problems, put ourselves in their shoes and, with certain humility, give them a voice. The cinema should be conceived in that way. Otherwise it remains a power trip. It is just a question of being ethically and politically sound. You have been preoccupied by the Rwandan genocide and also by the Congolese revolution. Do you prefer films that have a historical and political character? In the commercial American cinema, you have vengeance, and a happy end and the audience is content to consume a wonderful story. I try to find a link that will enable us to understand the world. I am against those who say that there are themes that are not cinematographic. It is up to us to make them accessible. My dream is to make popular films that provide something other than entertainment. Often, we are asked to choose between entertainment and thought. For me, there is no opposition. You are currently President of La Fémis, the French film school. Do you see new trends in the cinema of tomorrow? I have been very surprised by the resourcefulness of these young people. They have often impressed me more than many professionals. They are close to their roots, to the problems of today, even if their outlook is young. They are not afraid to take ownership of different styles, viewpoints, environments… they are very much in phase with themselves. The cinema is more rigidly formatted today than it will be tomorrow. In a video interview on Tuesday 15 May during a dinner for the Feature Film Jury, Raoul Peck talked about his role on the Jury.